Today’s App Review is 94 Seconds by Scimob. If your looking for an App that challenges your ability to think on your feet look no further than 94 seconds. The App gives you a letter and a category and has you try and think of a word beginning with that letter that is associated with the category. For example it may say Animal E in which case you may guess elephant. Categories vary from US states to food types, car brands and more. The 94 seconds really flies and all you need is one tough category and you’re done for. The game is a lot of fun and really challenges you once you get one answer it has you go on to another and the aim is to get as many correct answers in 94 seconds. First time round I panicked and did fairly terrible with a shameful 13 correct answers. As I played more I relaxed a bit but kept trying to beat my existing top score. Each category has easy and difficult answers and for the more uncommon answers you get more points for example for a fruit beginning with P you might choose pear and get 1 point but if you choose persimmon you would get extra points. There is nothing complicated to the game and it is a lot of fun the one difficulty I did have was with the autospell which did get me caught up in time. For example for musical instrument beginning with X I had xylophone but every single time it tried to correct that with cellphone until I gave up and just left it go through wrong. The App is a lot of fun and incredibly addictive and can be downloaded for free from HERE. 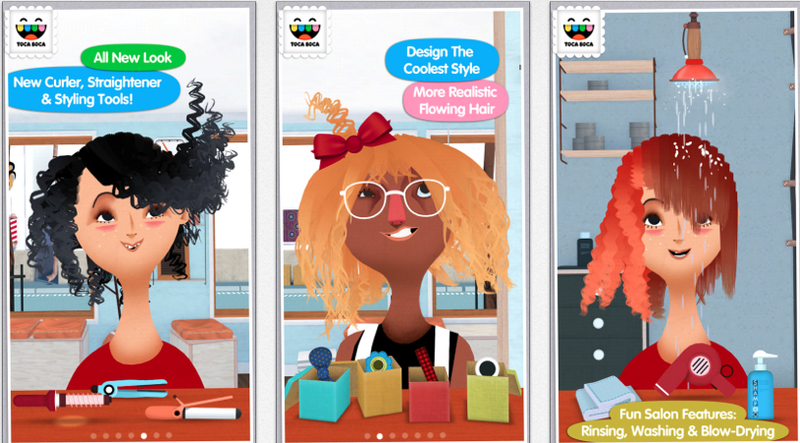 Today’s App Review is Toca Hair Salon 2 by Toca Boca. In the college the hair-dressing students have annual competitions and it is now that time of year where they are taking place and I am wishing I could create such fantastic creations. Unfortunately my ideas would probably end up in someone running away in tears at the sight of a hideous haircut so this App is instead a perfect alternative to the real thing. Given virtual models you can create wacky hairstyles and go crazy with colors. You can also be adventurous with facial hair. Starting with a basic wash and shampoo you can choose one of a selection of characters to pamper and there is about 10 different hair colors to choose from and the best thing is that when you do go cut crazy with the scissors there is a grow feature so you can make the hair grow back instantly. After your look is complete you can accessorise with hats and bows to make the look complete. Today’s App Review is Conundra by Sarah Pierce. If you’re looking for a challenging word App this is definitely one I can recommend. The game has you choose from two different selections either 6-7 letter words or 8-10 letter words and has three difficulty levels of practice, easy and medium. Once you select your level you then have to unscramble the letters to create a word. Honestly I totally sucked at this App the first few times I tried and and got maybe 1/5 right each round but after a while my brain got into the challenge and I found myself getting better and better. It took a while to move beyond the practice level which given that it is to be considered a practice I still found it challenging when it presented me with words like fascia, vertex which aren’t exactly in my everyday vocabulary. That being said it is frustratingly, mind boggling but in a good way and it boosts you confidence as your scores improve. It turns into an App you really do not want to put down. I would consider it great spelling and language practice for users although feel it is geared towards a more advanced vocabulary skill group than for kids. A great feature of the App is that it records your scores so you can check on your stats whenever you want to see your progress. For me the improvements were gradual I didn’t become a genius at it in a day but it certainly paid off and I learnt some new words along the way too. The basic version of the App is free with option in-App purchases and can be downloaded from HERE. 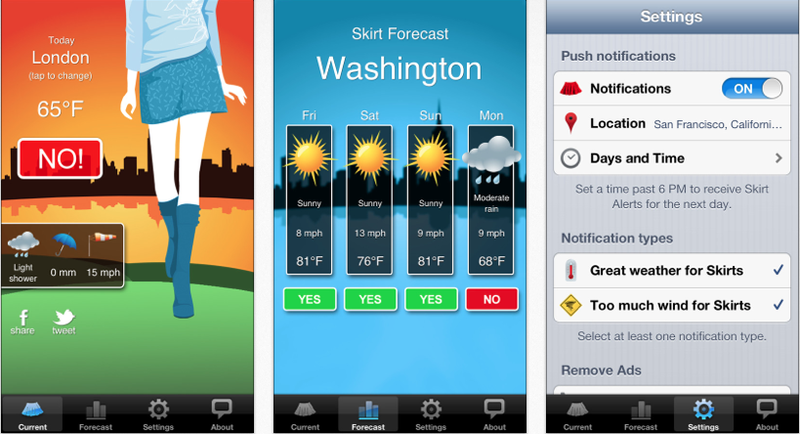 App Review – Skirt Alert. 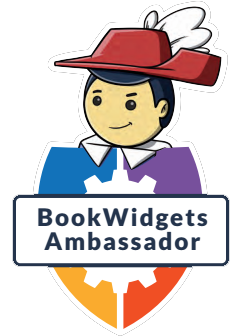 Today’s App Review is Skirt Alert by Wikibros. They say there is an App for everything but this one had me laughing so much. Crazy concept aside it is actually a really good idea. How many of us go out wearing skirts and end up freezing our aaaaaankles off? This App is the perfect solution and as soon as you wake you can open the App and it will tell you how suitable the weather is for a skirt. How many girls (or guys!) end up in that red-faced situation where suddenly a gust of wind takes revenge on your skirt well fear no more just take advice from this App. All you have to do is set your location and you can get instant alerts. It is also handy as it can double as a weather App so you get the temperatures for that day. You can set two notifications one being ‘great weather for skirts’ the other being ‘too much wind for skirts’ if the App considers the day inappropriate for your fashion plans then it will simply display a NO! alert. Today the App checked with the Skirt God and advised me that the 11degrees with 27km/h forecast would not be suitable for any skirt wearing plans taking it’s advice I stuck to wearing a pair of jeans! Unfortunately the Skirt God doesn’t have my hopes up for being able to wear a skirt for the rest of the week either predicting high winds all week. Now if only the Skirt God could bring in the summer then it would be a genius App. So while many myself included may not consider this App more than a novelty at first it is quite good for wardrobe planning and if you are not a skirt wearer it could be used to consider whether it might be an idea to wear a coat that day or just simply as a weather checker. App Review – Barefoot World Atlas. Today’s App Review is Barefoot World Atlas by Touch Press. All I can say about this App is one word. WOW! Never have Atlases been so fun. I never had many happy memories about World Atlases and actually relied on the old computer game ‘Where in the World is Carmen Sandiago’ to get me around the world. This App is incredible. You can travel around the world and find up to date information about any country you want from animals to sports, history and more. 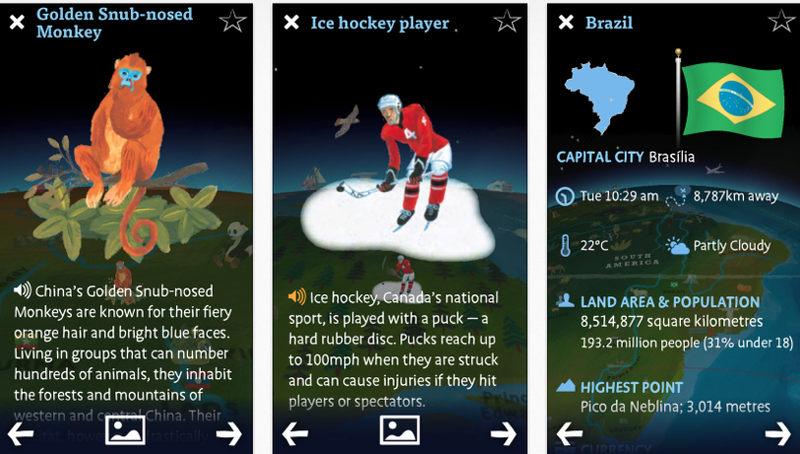 Each feature is either illustrated with amazing pictures or animations and the App is also narrated by geographer Nick Crane. There are also text titles. One feature I really like (well I like it all but one in particular) is that you can receive realtime information. So I can for example find out the current time and weather for Mexico or wherever in the world I want and I can also find how far the distance to there is from my current location. The App is also available in French, Spanish and Catalan so is not limited to English speakers which is important for an App like this. 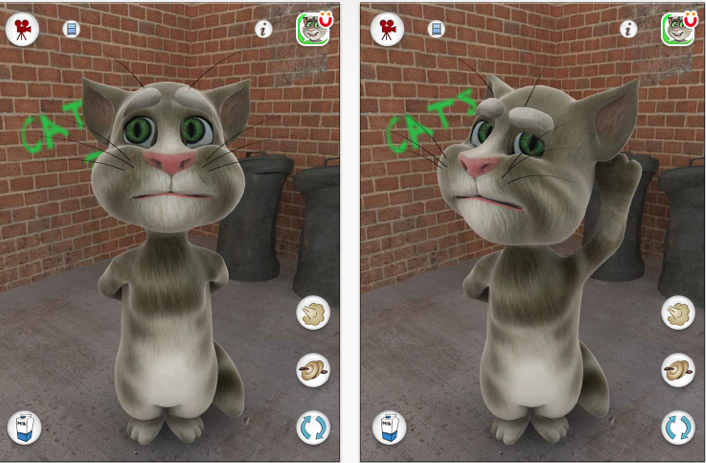 The touch features make this App so much fun you can spin the globe, touch the screen and interact with the App. A massive improvement on the traditional paperback Atlases so many of us grew up with. The only downside to this App and I have to consider it a downside is that because the features are so amazing and the quality of the images and features is so good the result is that the App is a massive 1.65gb in size which means if say you have a 16gb device that is limiting your space otherwise. That being said it is worth the space especially if you have kids. In a classroom situation I would consider it a must have on any iOS device. It is one of the best learning Apps I have come across and although I won’t be using it with kids I have downloaded it for personal use and find it to be really worth the 4.49 it costs and the gb space requirment. Today’s App Review is Word Mess by Masala Games. I have always loved word clouds and enjoy making them for my presentations so this App definitely caught my eye. 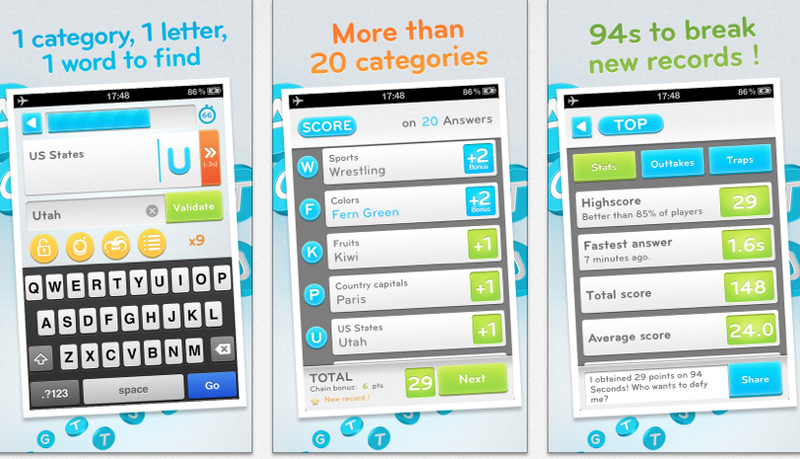 The App combines Word Clouds with the hidden object concept. Given tasks such as finding all words relating to board games, mythology, animals, geography etc it also has a few surprises along the way. I enjoy this game as it is one of those games that passes time especially when commuting. It is also nice to play when relaxing at the end of the day. What I enjoy most is the fact that the number of levels are endless so no playing it so much you then discover it is finished and you have to find something similar. This is something that has often happened to me so it is a bonus that this App doesn’t have those limitations. The App costs 89cent but has hours of fun included so I would definitely recommend it. 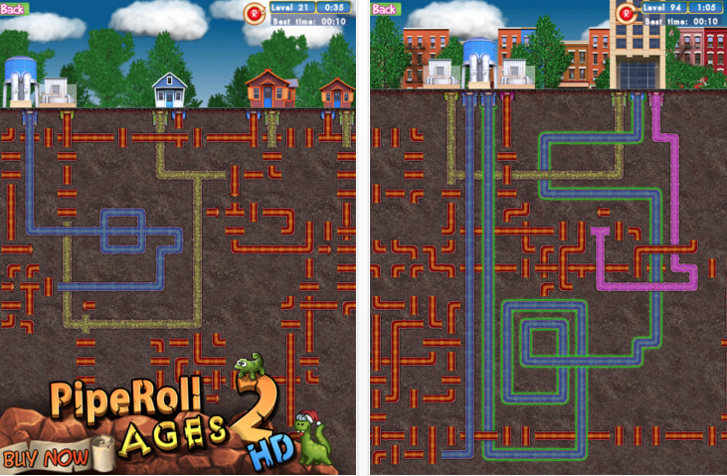 Today’s App review Pipe Roll by Navigation-Info Kft. When wondering what to do I came across this App and have really enjoyed it. There are around 100 levels and the aim of the game is to connect all pipes up so that the start and end point colours match up. Some levels match up easy others take time and end in frustration followed by a sense of achievement. There is not much else to the game other than connecting up the pipes but it is a great time waster and something to do on that rainy day. It didn’t take me long to get through the levels maybe a few hours and I was done. When I discovered it was the end I panicked because I thought it would take forever to find a similar game that I would enjoy so much but was really happy to discover that Navigation Info also have Pipe Roll New York, Pipe Roll Winter, Pipe Roll birds and a few more so there is plenty to keep you going. My current favorite is Pipe Roll New York. Today’s App Review is Cinemarama by Digital Click. This App was featured a few days ago and I had been looking forward to playing it all week. Today I finally had time and sat down with my iPad and planned to relax. The App tests your movie knowledge and to be honest I am not that great with movies so didn’t expect to do well. 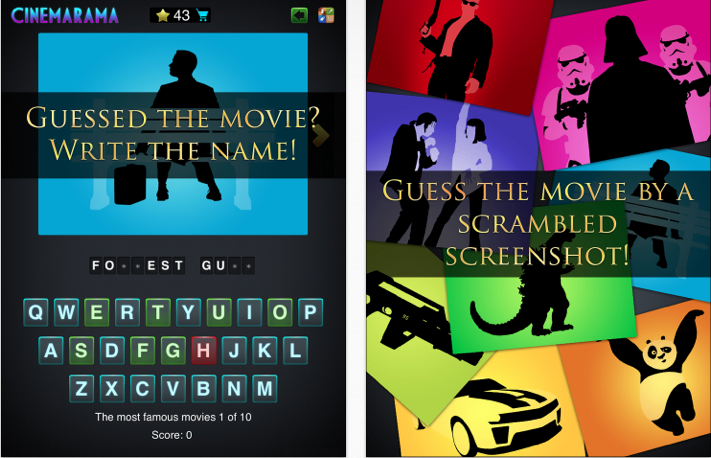 The game presents players with an image and the user has to guess what movie the image relates to. You have to type the letters in and get as many points as you can by guessing it without making mistakes. After 3 wrong letters you start losing points. Once your game points reach 0 you have to either win more points or purchase 100 points for 89cent. Levels in the game include – Movies that make you laugh, Biographies in Cinema and Epic Wheels. I did find this a lot of fun and did a whole lot better than I expected. My only complaint is that it only took me about an hour to complete all 29 categories (each has 10 levels). So the content isn’t too extensive but it is a fun game to play. There is some repetition for example Batman comes up under a few categories, same with Transformers but the game is well designed and definitely has great potential for future updates. While I played this alone I could imagine it would be great entertainment when hooked up to an Apple tv in a group situation.